More intuitive workflows, optimized layouts, more vivid visual feedback, and deeper integration with your studio setup: The next generation of MASCHINE and KOMPLETE KONTROL hardware gives you everything you need to create and keep on creating. The new MASCHINE takes our classic groovebox workflow and makes it faster and more intuitive. Optimized based on customer research, it's packed with new features to boost your speed and increase your focus all without breaking the workflow you love. Big, bold, and in your face, the larger pads create more room for complex moves like flams and rolls. New technological updates make the pads more sensitive to lighter touches, for more expressive playing. And since the center-to-center distance is exactly the same, your muscle memory and workflow don't have to change. With two full-color displays and the four-directional push encoder, you can browse sounds, FXs, plug-ins, and instruments with a tactile, one-handed, completely visual workflow simply find the thumbnail and load directly from the hardware. Plus, the high-res screens let you get more precise with your mixing, see an overview of your arrangement, or zoom in on waveforms to slice samples like a surgeon. 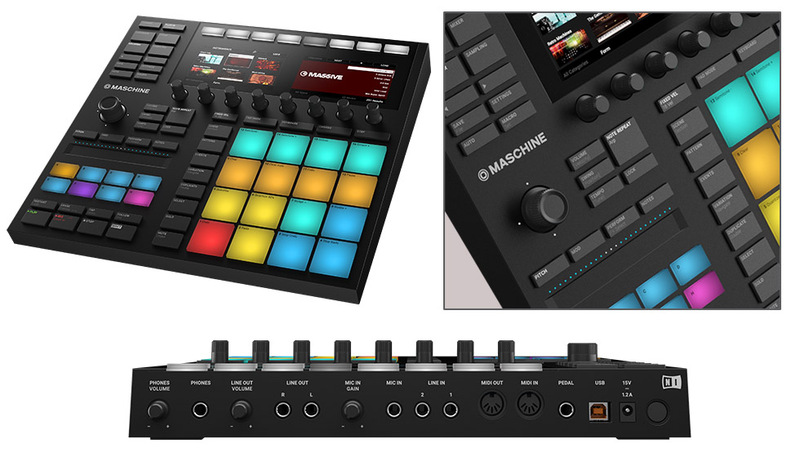 MASCHINE now comes with a studio-grade, 96kHz / 24-bit audio interface for pristine sound. Simply patch in a synth or add a dynamic mic for quick recording and sampling. Stereo line and MIDI ports make it a perfect centerpiece for any studio. Plus, it's USB-powered, so you can record anywhere with your laptop or plug in the included power supply unit for brighter pads. Komplete Kontrol - What's New? 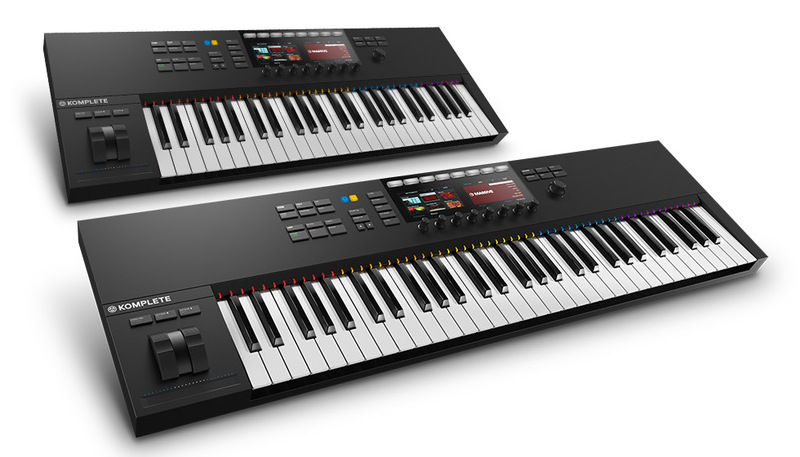 With the latest generation of KOMPLETE KONTROL, music-making becomes a more intuitive, hands-on experience. Perform expressively, browse and preview sounds, tweak parameters, sketch your ideas, then navigate and mix your project all from one fully integrated centerpiece for studio and stage. Finding the right sound amongst a sprawling sound library can be difficult, not to mention time consuming. Now you can find exactly what you're looking for across all KOMPLETE and Native Kontrol Standard (NKS) instruments using a simple, intuitive tagging system directly from the hardware. What's more, you can hear an instant preview of each sound as you browse. All of your KOMPLETE and NKS instruments are pre-mapped to the KOMPLETE KONTROL hardware by the people who know them best the instrument designers themselves. All essential parameters load instantly and are displayed across the two color displays, intuitively divided into pages. That means you can see exactly what you're adjusting in real time whether it's in kHz, dB, or BPM. NKS means intuitive control over hundreds of instruments from leading manufacturers including Heavyocity, Spitfire and Soniccouture. This extended plug-in format allows all developers to define the way their products integrate with NI hardware, so support for powerful features like tag-based browsing, Light Guide feedback, and pre-mapped controls now extends far beyond the KOMPLETE universe. And for VST instruments that haven't yet been updated to NKS, it's simple to create your own mappings from KOMPLETE KONTROL software.